Untill the Apple Watch, the wearable gadgets were not as famous and were struggling to survive but the launch of the Apple Watch and its success made on thing sure that the wearable technology is the next big thing. 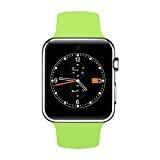 We have reviewed a lot of smart watches on these pages which are cheap yet reliable and perform their functions very neatly. ORDRO SW25 smartwatch Phone is one of the many smart watch phones available in the market but what makes it unique is the resemblance to the Apple Watch in all details. If you have never used an Apple Watch and you see the ORDRO SW25 smartwatch phone and Apple Watch placed side by side, it will become difficult for you to identify which one is original and which one is the clone. What makes the ORDRO SW25 smartwatch phone stand on the top of rest of the competition is its prices as well. With so much similarities you can get the ORDRO SW25 smartwatch for just $61 at GearBest. With 1.54 inch display and having strong metal plating frame, this clone of the Apple Watch has a digital crown like crown with it as well to perform different tasks. Running over MTK2502 chipset, it has 64 MB RAM and 128MB ROM and the support for TF card of upto 32GB for storage. With 240×240 pixel resolution, it supports Bluetooth 4.0/3.0 and is compatible with both iOS and Android phones although with some limitations over iOS. You can place a separate SIM card in the ORDRO SW25 Smartwatch to make/receive calls and use it as a phone as well. With built-in camera and remote capture feature, you can enjoy the photography with the smartwatch phone as well. Like any other smartwatch, the ORDRO SW25 smartwatch phone comes with all the smart features like pedometer, activity tracker and sleep monitoring options. The ORDRO SW25 Smartwatch phone is available in 3 colors and it is true clone of the Apple Watch to use and enjoy.